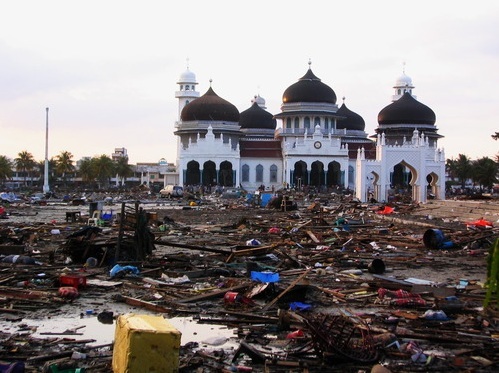 The Water Damage Caused By 2004 Indian Ocean Tsunami. In 2004, the third biggest earthquake ever recorded on a seismograph, at between 9.1 and 9.3 on the Richter scale, erupted underneath the Indian Ocean, triggering the Indian Ocean Tsunami that killed over 230,000 people and causing billions of dollars worth of water damage in dozens of countries. Indonesia was the first, and worst place to be hit by the tsunami, whose waves reached up to a hundred feet and above. India and Sri Lanka were also among the very badly hit places, suffering well over 12,000 and 35,000 deaths. The Tsunami was also observed as far as away as South Africa, where significantly smaller but still measurable waves washed ashore several hours following the initial earthquake, killing at least eight people. Furthermore, an estimated ten million more people had also been left homeless or displaced because of the tsunami. The extreme seismic activity of the earthquake itself shook the whole planet an estimated 1 centimeter, and in addition triggered earthquakes along faults as far away as Alaska. Given the degree of water damage suffered by the affected countries, it was also feared that the death toll well over 200,000 might possibly double because of the threat of waterborne illness and disease, which because of relief efforts was able to be avoided. However, the physical water damage caused by the sheer power of the waves, which inundated thousands of kilometers of coastlines on all sides of the Indian Ocean, was vast. Complete villages were wiped off the face of the earth and also cities suffered incredible damage due to the sheer force of impact and the subsequent flooding. The scale of the disaster motivated what is by some considered the largest humanitarian response ever conducted. The World Bank initially projected that total relief efforts would cost somewhere in the neighborhood of five billion dollars, USD. Over the next several years, the United States alone offered roughly 350 million dollars to help fund relief efforts. Even a number of big private corporations, for example, Coca-Cola, Microsoft, and BP, all pledged tens of millions of dollars towards recovery efforts in the affected countries. Within a week, around 1.8 billion dollars, USD, had been pledged by various countries throughout the world before relief efforts were relegated to UN control. Though immense, there has still been a big amount of criticism directed towards the US and Europe for their perceived insufficient allocation of funds. Some countries, Sri Lanka, in particular, criticized donor countries, claiming that they had yet to see any of the pledged donations made by some countries at all.